As a gunsmith one of my favorite pastimes is to rip apart guns I haven't seen before to challenge my mechanical aptitude. And usually my patience, but that's another story entirely. If you bought an LH9, DP51 or any other variant of the excellent Daewoo lineage but haven't been able to find good information on the pistol's internals, you've come to the right place! I'm working on a full disassembly/reassembly guide for detail stripping currently, and put together a (hopefully) helpful parts diagram of the frame. 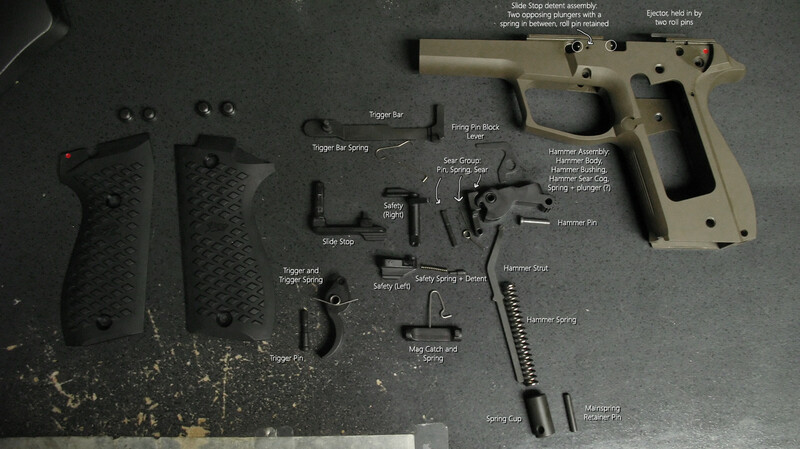 The parts are laid out somewhat logically with components grouped together and more or less arranged relative to their positions in the gun. The sear, sear spring, and hammer for example are all lined up facing how they would when assembled, to give you indication of how the spring faces. Note: DO NOT ATTEMPT TO DISASSEMBLE THE HAMMER. Leave the bushing alone and the hammer assembly in one piece! LH9 Breakdown Part 2: Process and Thoughts » « Happy New Year!